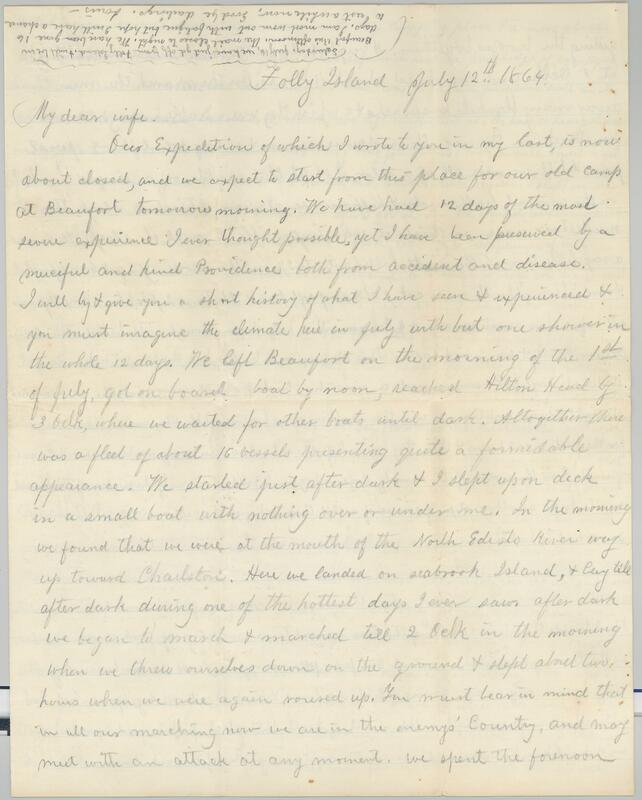 Item Description: Jonathan Lewis Whitaker writing to his wife, Julia, about the USCT regiment marching from Beaufort, through Hilton Head, to Charleston. Details about the troops marching, rations, some fighting w/ Confederate troops. Item Citation: Letter dated 12 July 1864, in the Jonathan Lewis Whitaker Papers, #3674-z, Southern Historical Collection, The Wilson Library, University of North Carolina at Chapel Hill. Our expectation of which I wrote to you in my last, is now about closed and we expted to start from this place for our old camp at Beaufort tomorrow morning. We have had 12 days of the most severe experience I ever though possible, yet I have been preserved by a merciful and kind Providence both from accident and disease. I will just give you a short history of what I have seen and experienced and you must imagine the climate here in July with but one shower in the whole 12 days. We left Beaufort on the morning of the 1st of July, got on board boat by noon, reached Hilton Head by 3 o’clock, where we waited for other boats until dark. Altogether there was a fleet of about 16 vessels presenting quite a formidable appearance. We started just after dark and I slept up on deck in a small boat with nothing over or under me. In the morning we found that we were at the mouth of the North Edisto River up toward Charlston [sic.]. Here we landed on seabrook Island, and lay till after dark during one of the hottest days I ever saw. After dark we began to march and marched till 2 Oclck in the morning when we threw ourselves down on the ground & slept about two hours when we were again roused up. You must bear in mind that in all our marching now we are in the enemy’s country, and may meet with an attack at any moment. We spent the forenoon getting the troops together. A very hot day. We commenced marching at 3 Oclk and marched about 4 hours. 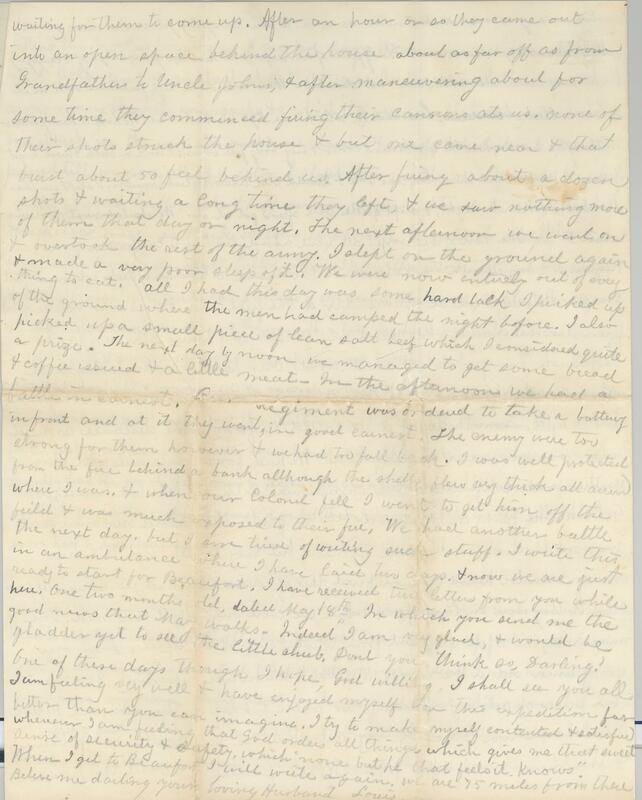 On the march, the men threw away many blankets, knapsacks & e. which they were unable to carry. Some were sunstruck on the way. The roads were narrow & sandy & dust flew & sweat poured till we were all of a color. I slept this night on a single blanket on the ground half under & half over me, I mean I tried to sleep, the musketoes [sic.] were so thick it was impossible to call it sleep. It rained a very little through the night. Called out 2 1/2 in the morning to get breakfast & start. I brought with me to eat 3 slices of soft bread, & butter. 2 pickles, 2 small pieces salt beef, a few sweet cracker & 4 cheese, with a half dozen doughnuts. Besides this coffee, sugar & salt & some hard tack. This all give out today but the hard tack. We got started at daylight, & commenced a march which I shall never forget. We marched straight ahead until noon and the weather was boiling hot. The men done very well for the first 2 or 3 hours & then they began to fall out, I had to bring up the rear & consequently had the word of it. Ment by dozens began to fall down by the sides of the road unable to go another step. Of course if we left them behind the rebs would get them & so we had to keep them up some way. while the very worst cases we put in ambulances and stretches I had to ride the whole length of the line several times making my work much harder as the lines was miles in extent. One poor fellow dropped dead & was burried [sic.] by the way. I came very near giving out at one time & had to get off my horse, but I soon felt better and went on. Right in the midst of it all the rebel pickets fired upon us & we did not know but we should have a battle night away. They fell back however & did not molest us any moore [sic.]. At about noon we came to our camping place and a more glad set of humans you never saw. The offices of our regiment had the privilege of occupying the house of some rebel which was now deserted. There was some rich furniture still in it a piano, clock, bureau, bedsteads to, which we left undisturbed. We had a heavy shower in the afternoon when the air became cooler & every body felt better. I took a bath & tried to get off some of the dirt but the water was salt & I could not accomplish much. I slept in the Rebel mansion to night, & slept quite well after I got at it. We started next morning about 5 oclock. The rest of the troops all went ahead, leaving a companies of our Regiment & myself with the colonel, to command a bridge which we had just crossed. This day I will also remember the first time I was ever under rebel under fire. After the main body went on for two or 3 hours the rebs began to fire on our pickets out in the woods. Our head quarters today were also a rebel mansion but much finer than the one we occupied last night. From the top of it we could see for some distance around but woods were near on every hand. We had four companies out around in the woods watching, & two companies with us at the house, about 9 oclock. 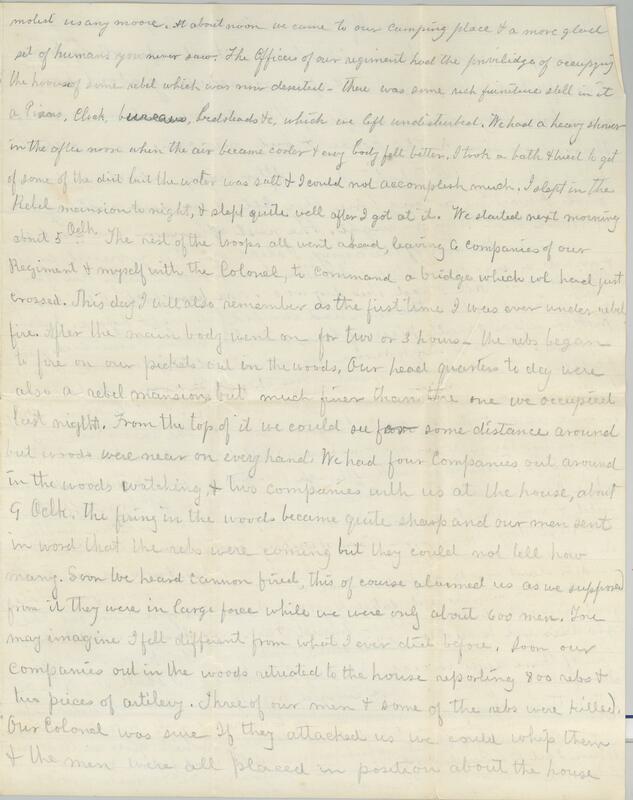 The firing in the woods became quite sharp and our men sent in word that the rebs were coming but they could not tell how many. Soon we heard cannon fired, this of course alarmed us as we supposed from it they were in a large force while we were only about 600 men. You may imagine I fell different from what I ever did before. Soon our companies out in the woods retreated to the house reporting 800 rebs & two pieces of artillery. Three of our men & some of the rebs were filled. Our Colonel was sure if they attacked us we would whip them & the men were all placed in position about the house waiting for them to come up. After an hour or so they came out into an open space behind the house about as far off as from Grandfather’s to Uncle John’s; & after maneuvering about for some time they commenced firing their cannons at us. None of their shots struck the house & but one came near & that trust about 50 feet behind us. After firing about a dozen shots & waiting a long time they left. & we of them that day or night. The next afternoon we went on & overtook the rest of the army. I slept on the ground again & made a very poor sleep of it. We were now entirely out of everything to eat. All I had this day was some hard tack I picked up off the ground where the men had camped the night before. I also picked up a small piece of lean salt beef which I considered quite a prize. The next day by noon we managed to get some bread & coffee issued & a little meat. In the afternoon we had a battle in earnest. Our regiment was ordered to take a battery in front and at it they went, in good earnest. The enemy were too strong for them however & we had to fall back. I was well protected from the fire behind a bank although the shells few very thick all around where I was. & when our Colonel fell I went to get him off the field & was much exposed to their fire. We had another battle the next day. but I am tired of writing such stuff. I write this in an ambulance where I have laid two days, & now we are just ready to start for Beaufort. I have received two letters from you while here. One two months old, dated May 18th in which you send me the good news that Mary walks. Indeed I am very glad, and would gladden yet to see the little chub, don’t you think so, Darling? One of these days thought I hope, God willing, I shall see you all. I am feeling very well & have enjoyed myself on this expedition far bette rthan you can imagine. I try to make myself contened & satisfied whenever I am feeling that God orders all things, which give me that sweet sense of security & safety, which “none but he that feels it knows.” When I get to Beaufort I will write again. We are 75 miles from there. Believe me darling your loving Husband Louis. 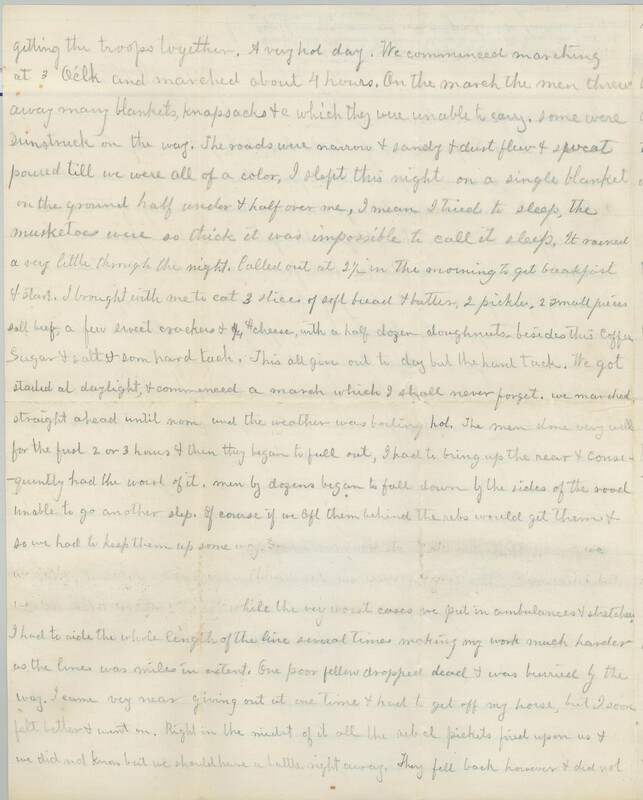 This entry was posted in Southern Historical Collection and tagged Beaufort, Charleston, Charlotte, Civil War, conditions, troops. Bookmark the permalink.